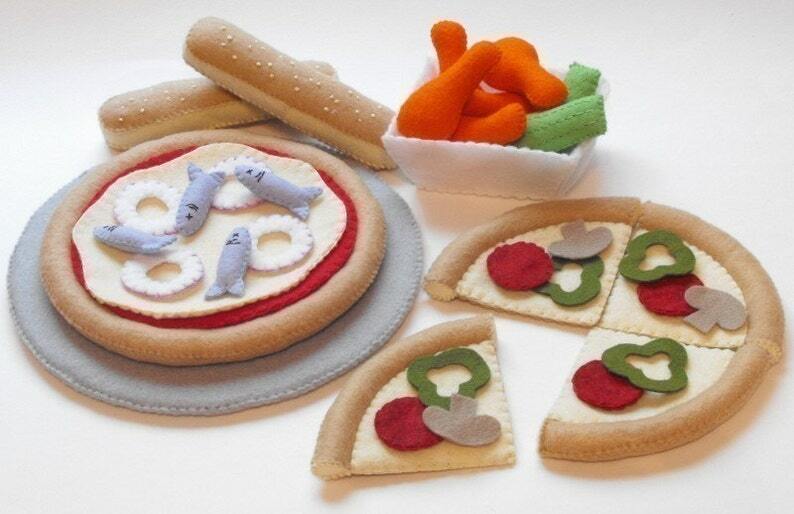 Take orders from your friends and make them a felt pizza to remember! Assemble a whole pizza with crust, sauce, cheese and toppings. Place it on the pizza pan and "bake" to perfection. Slices make it fun to give everyone their favorite toppings such as: red onion slices, green pepper rings, pepperoni, mushrooms and anchovies! In the mood for something spicier? How about a fresh order of Buffalo hot wing drummettes and a couple crunchy celery sticks? Round out the menu with long bread sticks sprinkled with parmesan cheese. Yum!